Foxtrackr CIRCUIT allows you to integrate our hardware product into your own product of own electronic design a it can be delivered as electronic schemas. We are providing different type of circuit with different battery options. You want to save time in your hardware design and component selection, we are providing the CIRCUIT schematics we use for accelerating your design or letting you directly produce your devices. This offer starts for 100 pieces and is licensed by pieces depending on the actual range you are. It is per produce devices. We are providing Kicad files or Gerber Files. The COMPACT circuit is the smaller of the family, it own a UFL connector for an external RF868 antenna and UFL connector for an external GPS antenna. 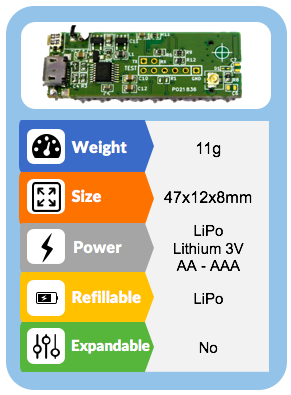 It support different powering options : 3,7v LiPo with usb battery charger, 3V Lithium CR2, CR123 or 2xAA(A) and 3xAA(A) batteries. The circuit is delivered with a GPS active antenna and a RF868 antenna. Misc delivery option are possible and may generate custom price. The SQUARE circuit is the last version of Foxtrackr circuit with an extended capacity for expansion card, supporting standard batteries, including RF antenna on PCB and offering a low profile with a specific PCB format and associated GPS antenna. One screw allows to attach the PCB in a box. 3xAAA batteries can directly be attached on the PCB. Batteries are not provided. 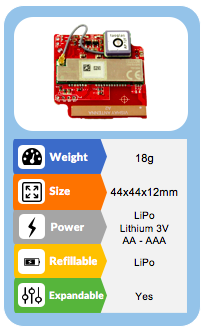 This option is a combination of the different previous combinations : The circuit is offering a large choice of power source and the ability to refill a LiPo battery over an USB connector. 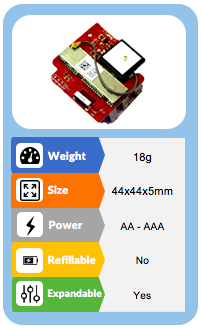 The board can be expanded with a daughter board with specific sensors.